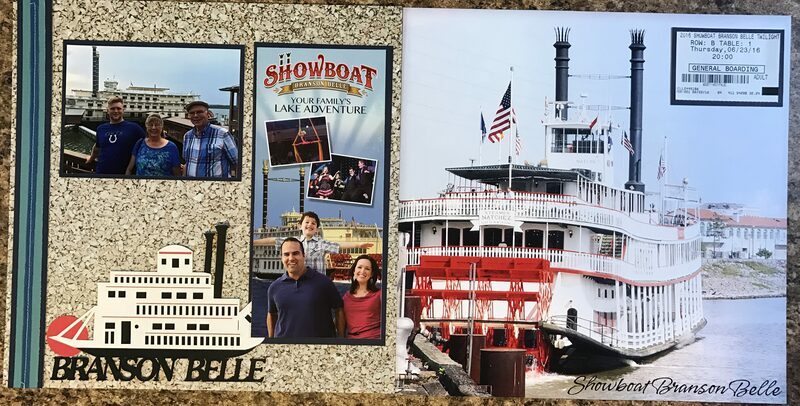 On the first night of our family trip to Branson, MO, we went to the Showboat Branson Belle. Unfortunately there was a storm that night, so the boat did not make the trip around the lake, but the show and food was fantastic, and we had a great time anyway. For this spread I used a background page that I purchased at a local scrapbook store in Branson, MO, (Scrapbooks Forever), and attached the ticket from the event in the top right hand corner. I bordered this in black to complement that black of the writing on the page, as well as the steam stacks. For the left hand page I used a gravel paper, to match the rocky shore near the boat, and a cut out which I purchased at the same scrapbook store. The picture and brochure are bordered in black to match the rest of the spread, and the brochure is affixed to the outside of the plastic page protector so that the reader can open it to view it. If you like at the left hand side you will notice that I used my sewing machine to stitch down the blue and black border for this spread – in keeping with the theme of this album.